Better late than never, I am running a bit behind on Mojo Monday. I have a valid excuse though, I was on a course for three days and it burned out my brain a little so there was no crafting after a day of class. I started this card with the flower, then worked all the other aspects of this sketch around it. The stick pin threw me for a little loop but I was able to work it in at the end. Supplies: Cream and red cardstock, Designer Paper-American Crafts, Slice-Basic Elements 2, Making Memories Trinket Pin, Crystal Stickers gem, misc ribbon. A quick card this morning. I am finding all sorts of paper treasures, I love this paper and I have a few variations of it but have never used it or at least not for while. I don't know how many times I have looked at some of my craft supplies and said I will save that for something special. I have turned a corner... I am now all about 'Just use it, they are all special'. I started with craft cardstock, added Scenic Route double sided designer paper for two layers then used craft cardstock to make a tag. I quickly inked the edges then I stamped Howdy, and finished with pearls. 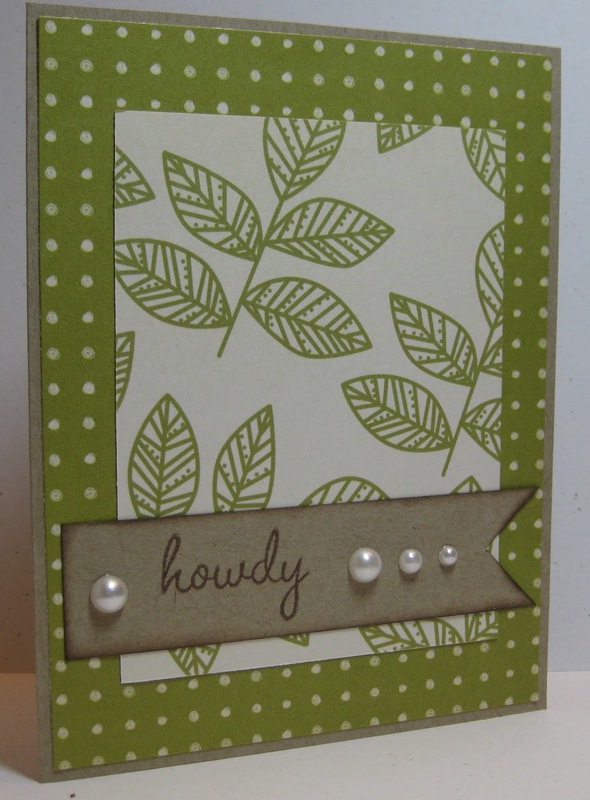 Supplies: Craft cardstock, Designer Paper-Scenic Route, Fiskars-Howdy, Kaisercraft-pearls. Have a great weekend. Sam can you please send me your email address. 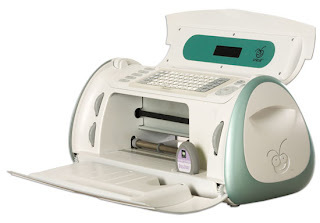 My husband just brough me a Cricut Create from Michaels for $39. What kind of crazy pricing is that? Sometimes that is all it takes is a simple Hello to make someone smile. Have you made someone smile today? Supplies: Cream and brown cardstock, Designer Paper-Memory Box, Inkadinkado-Hello, Jolee Boutique-Together Blossoms, American crafts ribbon. I can't believe that we are half way through January already. The year is not really started and it already seems to be on fast forward. I have a Mojo Monday card to share. I think I tore my poor craft supplies apart looking for a Designer Paper to use today, I am not looking forward to putting it to rights when I am done. This is my end result. I am pretty proud of the fact that I was able to use make most of the card with a Colorbok paper pack I picked up this past summer. Supplies: Craft Cardstock, Designer Paper and Die Cut-Colorbok, Stampin’ Up!- Watercolor Trio, Spellbinders-Lacey Circles and Standard Circles, misc ribbon. Nothing is harder then saying goodbye to someone you love, I think this sentiment says so much. We have a friend who lost some one who was very dear to them recently, this was what I found worked best on her card. I have accumulated a ton of Designer paper from dollar stores over the last few years, for the most part I flip on by them or give them away. This one, which really, I am not sure why I brought in the first place jumped out at me yesterday. I immediately had an idea in my head and it turned out better then I could ever expected. 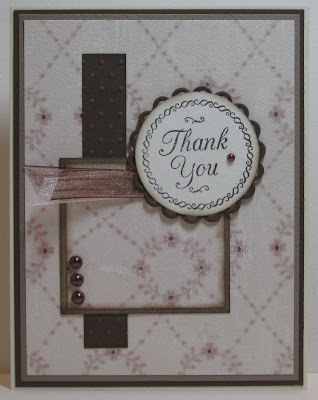 This card is all about layers, I wanted the roses that edged the paper to be visible with each layer. They make pretty focal points and I wanted there to be a few and to flow together. I typed the sentiment out with Word, my printer was not happy when I wanted to print the sentiment but in the end I got what I needed. I finished it it off with brass brad and a pretty flower. I used this great tutorial from Splitcoast on how to make flowers from ribbon. It was supper easy, and made me pretty happy with myself when I made it work. Supplies: Natural Ivory and brown cardstock, Designer Paper-Unknown, Making Memories Copper Brad, Hero Arts Lace Ribbon, Microsoft Word. Happy Friday, I have a very quick card to show. It has been awhile since I have attempted a shaped card. The card itself is suppose to be simple, but I think I struggled with it more than if it had multiple layers. Spellbinders- Labels One was used to die cut the shape, I used Versamark Dazzle in Champagne to stamp some background images. I stamped the small butterfly twice and embossing it with Ranger-Antique gold embossing powder, then cut the second butterfly out to pop it up. 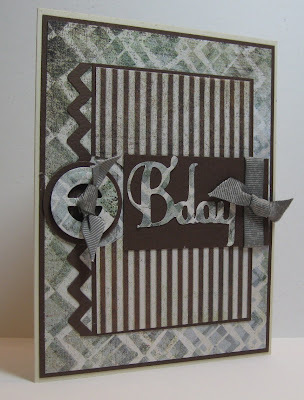 I stamped Thinking of you, and embossed it leaving extra embossing powder. I finished with some Kaisercraft pearls. Supplies: Natural White cardstock, Close to my Heart-Butterfly Wings, unknown – Thinking of you, Ranger-Antique Gold embossing powder, Kaisercraft Pearls, Spellbinders-Labels One. As promised happy Mojo Monday :), I have no idea how I was creative after a huge birthday meal and cake but here I am. Mind you I did not stray to far from Julee's sketch. I brought one of those large packs of paper from Costco, the MemorySkor ones that smell funny but have a great carrying case. Anyway, there were some great doublesided pages in the pack but other ones were just bizarre to my eyes. I ended up donating a large portion of the paper but kept some of the tamer ones for my use. This is one of those papers. It worked out well I think. I stamped the stars from the There She goes- Bit of Stardust clear stamp set, I cut them out and coated them with Versamark and embossed them with Stampin Stuff- Detailed Black. I tried the same with these little plastic stars but well, the tips started to curl a little so I had to be careful :). In the end it turned out. I used this gorgeous ribbon that I found hidden in my ribbon drawer, from certain angles it looks brown from others black, so for this post it is black. 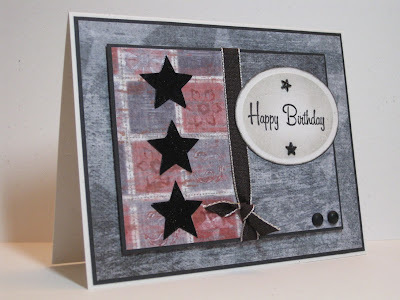 Supplies: Natural Ivory and black cardstock, Designer Paper-Double sided MemorySkor,Stampendous-Happy Birthday, There She Goes-Bit of Stardust, Spellbinders-Classic Oval Large﻿, Pink Pebbles-Black Candy Dots, misc star stickers, misc ribbon. Happy Birthday to my son Zach, I am still shaking my head that he is 17 today. I had originally made a different card for him but once this one was done, I liked it much better. I used one of the cards out of the PaperCrafts-A Card a Day as a sketch. Supplies: Cream and brown card stock, Designer Paper-Upsy Daisy designs, Sizzix-Flourishes, misc circle punches, Offray ribbon-brown, misc button, Pink Pebbles - brown candy dots. I will be back later tonight or tomorrow with my Mojo Monday. I am making my way through some of my stockpiled papers, this pretty double-sided Fancy Pants- Emma's garden was perfect for this simple card. 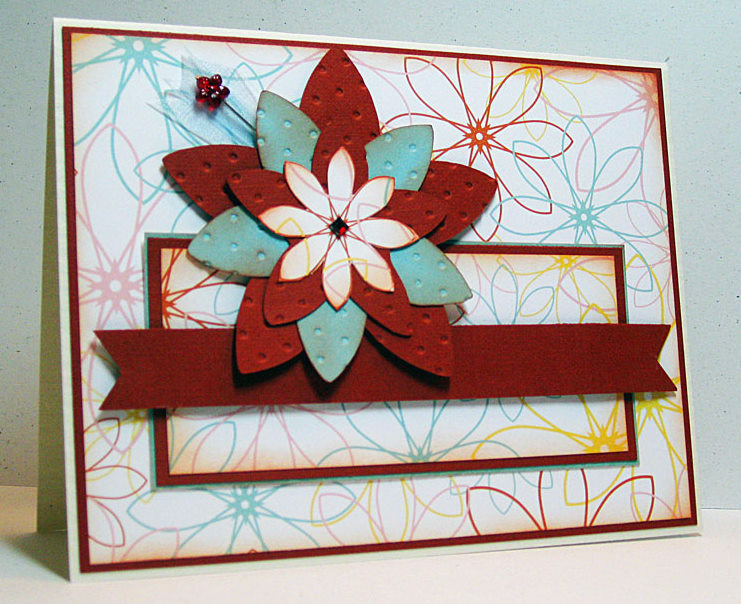 The pretty little flower, is popped up and stands out a little more on the card then in this picture. So I am flipping my way though the book, using the cards as a sketch to see what I can come up with. A new blog look and a Mojo Monday . Why Wheat? I have no idea. I have signed up for a Tombow Certification workshop later this month so I thought I would take a look at some of the YouTube Video’s by Marie Browning. I love how she makes simple but beautiful lavender and wheat pictures. So when my sweet sister Barb offered to revamp my blog I told her wheat. I love what she came up with. She designed the little wheat images in the blog header, wonder if we will see them forsale anytime soon at the Shop? What about a Harvest kit sis? This is today’s Mojo Monday sketch, it is my last day before I head back to work after vacation so I am able to sit down in my craft space to create. It feels great. I had this card partially started, well the background layers anyway. I have been looking at this designer paper for weeks wanting to use it but it just would not come together, today it did. 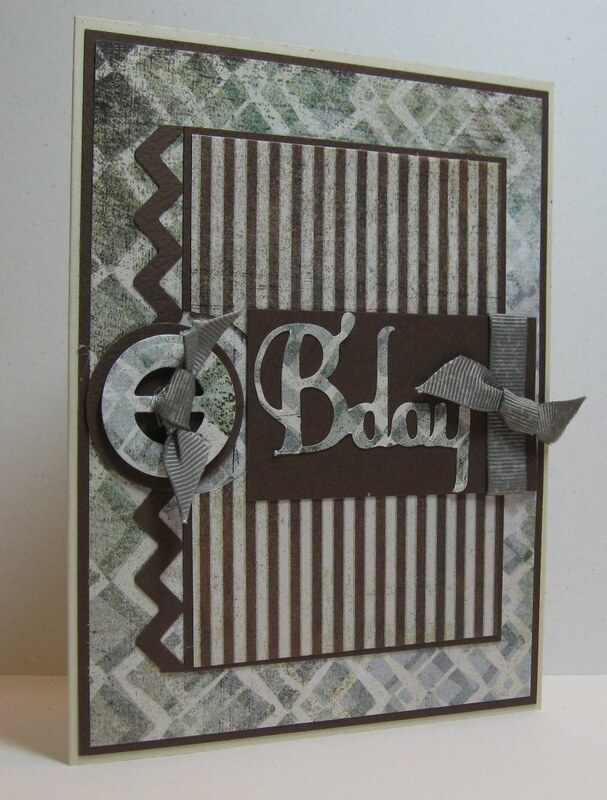 Supplies: cream and brown cardstock, Designer Paper-Wild Asparagus Happy Birthday, Kaisercraft brown Pearls, Celebrate it ribbons. Oh :) and HAPPY NEW YEAR.